Both these words generally used while referring to the repayment of a loan which was taken by putting the asset as a mortgage or as a security. These are two different types of options available to the owner who consistently fails to repay the loan at a time. Both these terms are used at the different time depending on the situation. 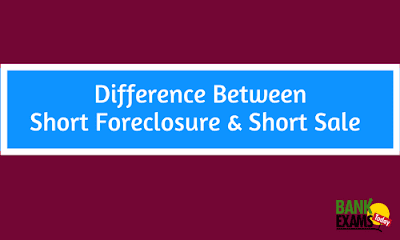 Foreclosure is one kind of legal procedure in which the lender seizes the mortgaged property of the owner. This circumstance occurs because the owner of the property fails to repay the loan amount to the lender at a specific time. So, it makes compulsory to the lender to put a mortgaged asset to the forced sale in an auction. By doing this the lender can cover the remaining or whole debt amount which the owner failed. Foreclosure is a legal action taken by the lender to cover the outstanding debt and redeem the mortgaged property. By doing foreclosure the lender can freely sell the borrower's property. In this, if after covering the borrowed amount something is left it transfers to the borrower. In short, Foreclosure means the situation occurs in which the owner of the property constantly failing to repay the loan amount and in this situation, the lender takes possession of the mortgaged property. A short sale situation occurs when the borrower owes more debt than the property or an asset which was mortgaged and the borrower is unable to pay the outstanding debt amount. In this situation, if the remaining balance to the lender accounted as a deficiency. In this, while selling the property the lender doesn't play an active role. It is a very lengthy process and requires lots of permissions. So in short, a short sale means to give a right to sell their own property and pay the debt amount to the institution, entity or the person. In this the lender seize the property of the borrower and put it in an auction to cover the debt. I this the lender gives right to sell the property on his own and pay a debt to the lender. When the value of a property is more than the borrowed amount or outstanding debt. When the Borrowed amount or outstanding amount is more than the selling value the property. In this method the selling is done in an auction. The selling is made by the owner himself after got permission from the lender. It highly affects the credit history of the borrower. It has less effect on the credit history of the borrower.